Daytona Beach Shores has it all. Oceanfront and riverfront condos offer wrap around balconies that provide incredible views of the Atlantic Ocean and Intracoastal Waterway! 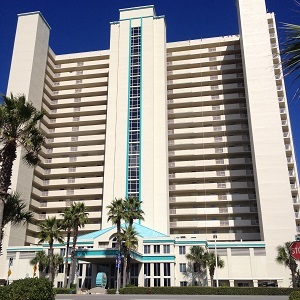 Daytona Beach Shores condos can be purchased on the "no drive" areas of the beach! Believe it or not there are luxury condos in gated yacht and golf club communities for those who love to fish, boat or golf! Many of these buildings are also pet friendly. Amenities include: indoor parking, on-site security, oceanfront heated pools, spas, saunas, hot Tubs, fitness centers, private club rooms, and more! All building maintenance, pest control, lush tropical landscaping, pool maintenance, care of common grounds and many other services make Daytona Beach Shores condo living a smart choice for a relaxing and carefree lifestyle. Are you a yacht owner? Invest in a luxury riverfront condo that includes boat slips long enough to accomodate a 60 foot yacht! Are you a golfer? Enjoy the areas 20 public golf courses. If you are seeking luxury and style look no further, Daytona Beach Shores offers just that.